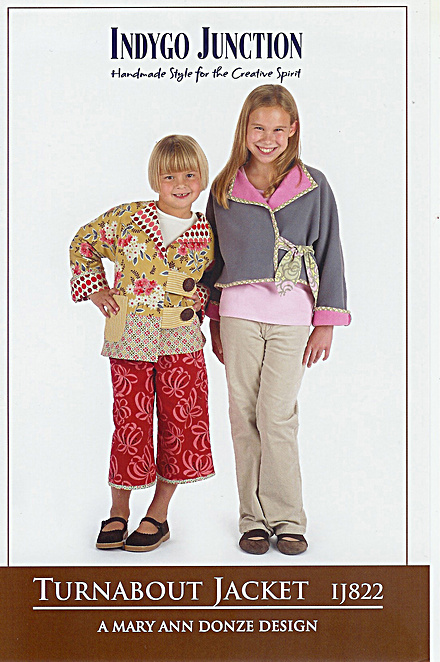 This jacket designed for children ages 1 to 10 years allows for years of wear with turned up dolman sleeves to let down over time. Its loose, asymmetric style easily adjusts to the growning child. Construct in the upper hip length or by adding the lower bands to extend the jacket to just below the hip. For an unlined jacket, use any two-sided fabric such as polar fleece, linen, batisks, cottons, etc. and finish its edges with fabric binding, bias chenille or serger by creating a fully reversible garment.